It’s very easy to create an account on eSurveysPro.com. You just need to click the “Subscribe” button from the home page of the site and you are redirected to a very simple signup page where you just need to fill in a few fields, the most important being your email address and password. After the registration, an email is sent to you with your login details. You are redirected to a page that displays a thank you message and links that could guide you through the content of the site. We will follow the “Create new survey” link to get started with the survey creation process. Copy an existing survey. This is not possible for us, since this is our first survey. 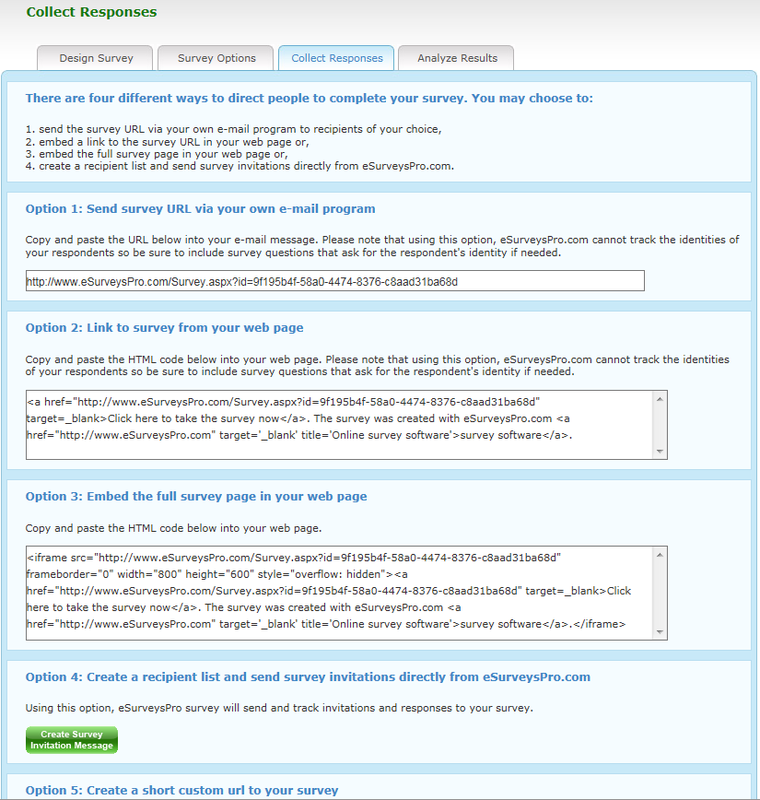 Copy a survey from eSurveysPro.com templates library. Unfortunately this feature is available only for paid accounts, so we will not be able to use this feature either. The survey editor page that follows looks very clean and intuitive. We will start adding a few questions to our first survey. Clicking on “Insert question” button, we will arrive to the questions editor page. There are 18 question types, 14 available for free and 4 question types available only for Corporate and Enterprise accounts. The question builder uses a rich text editor for the question text. Premium accounts and above can also take advantage of the integrated spelling checker that can work with several languages. Allow respondents to create their own “other” answer. Depending on the question type, other options are displayed. For example for the multiple choice questions, you can specify the minimum and the maximum number of answer options that the respondent can select. Choice questions can use predefined scales from the scale library. Most interesting are the countries of the world or the states in US. It can save you a lot of trouble when you need something like this. Corporate and Enterprise accounts of eSurveysPro.com can also use a more advanced feature called “question visibility”. Using this feature you can choose to display your question only if certain conditions are met. Here is how the survey editor looks after adding several questions to our survey. There is no limit of the number of questions that we can add to the survey. 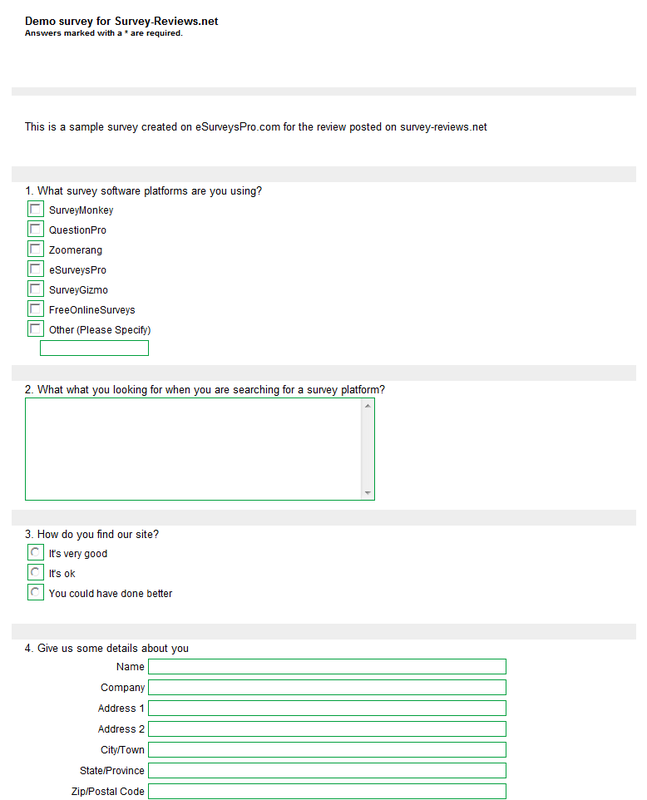 Also, there is no limit to the number of surveys that can be created on eSurveysPro, even by free account members. 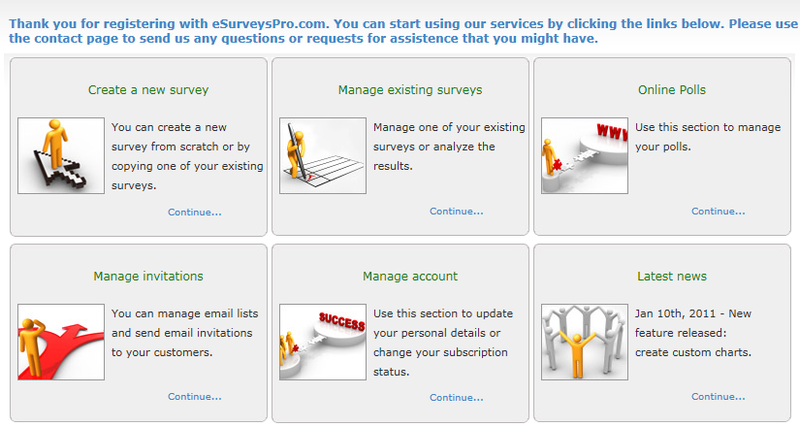 These are the features that make eSurveysPro one of the best providers of free survey software. It’s very easy to edit, delete, insert and move questions. eSurveysPro.com also provides for all accounts, including free, advanced page logic functionality. 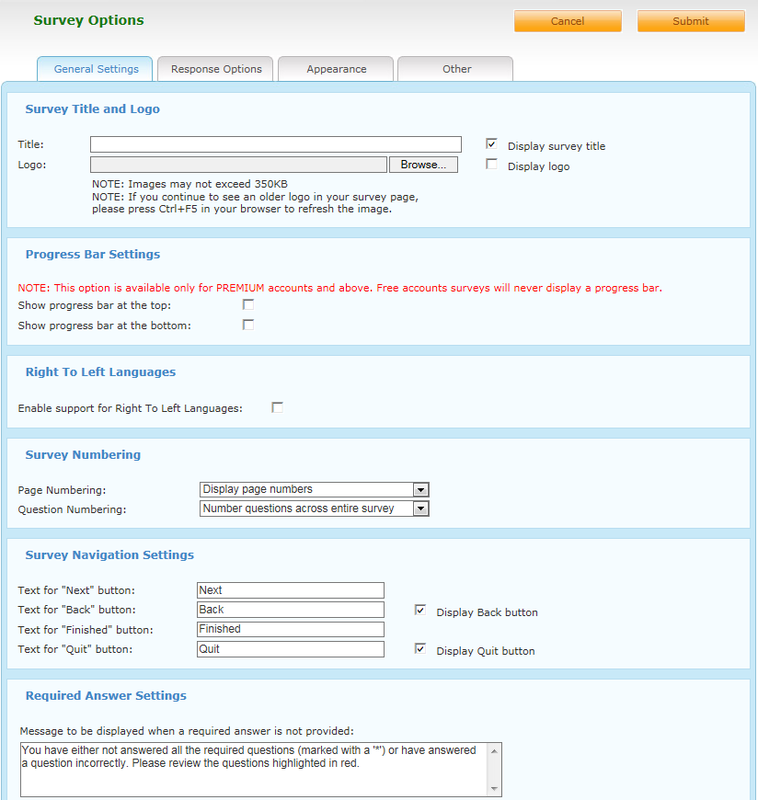 Survey page logic is used to control how a respondent moves through the pages of a survey. By default, when a user clicks on the “Next” button, the user is taken to the next page of the survey. However, sometimes you might want the user to skip some pages with questions that are not relevant to the user based on the answers given on previous questions, so it is useful to override this default behavior. When page logic is added to a page, the logic conditions are evaluated when a respondent exits that page. The logic conditions then control if the user is directed to the next page or some other page. Page logic can be added to a page while editing the survey by clicking on the “Page Logic” button in the title bar for the page. Send email notifications when a response is received. Premium accounts or above can also create a shorter survey url with a custom text in it. Here is the link to our survey. 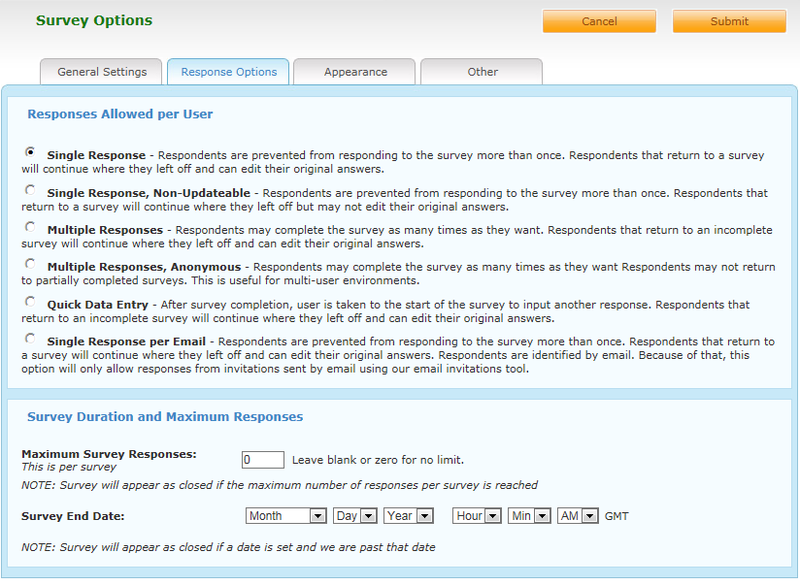 In order to be able to receive responses to the survey, you need to open it first in “Manage surveys” section. The main problem with the live survey page is that eSurveysPro.com displays ads for free account users. The advantage of still using eSurveysPro despite of that is that you can receive an unlimited number of responses to your survey, even if you use a free account. 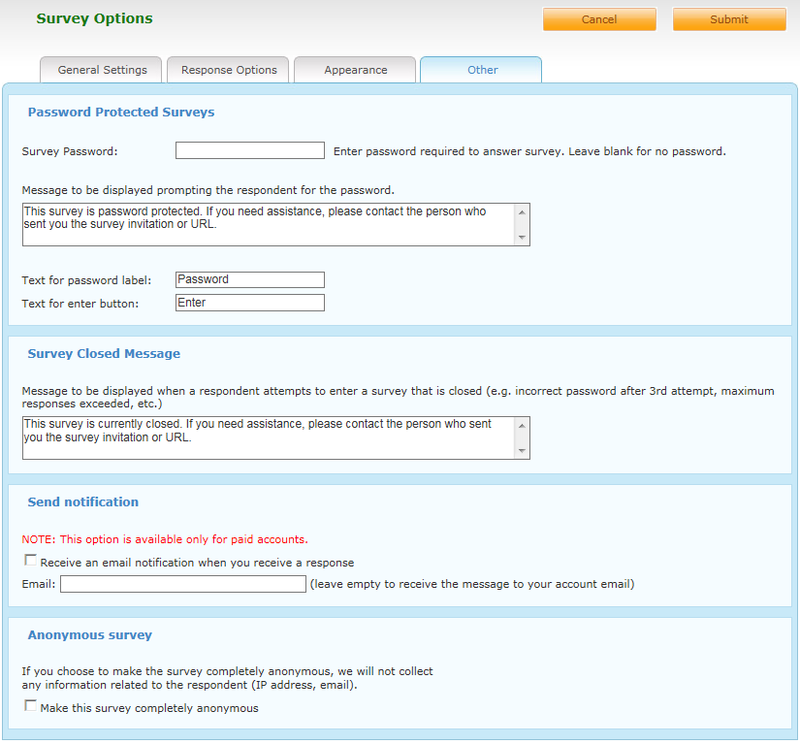 After a response is added to the survey, for free accounts, the user is redirected to a standard thank you page. Paid accounts can customize or remove this page. We will start adding some response to our survey so that we can test the reports. 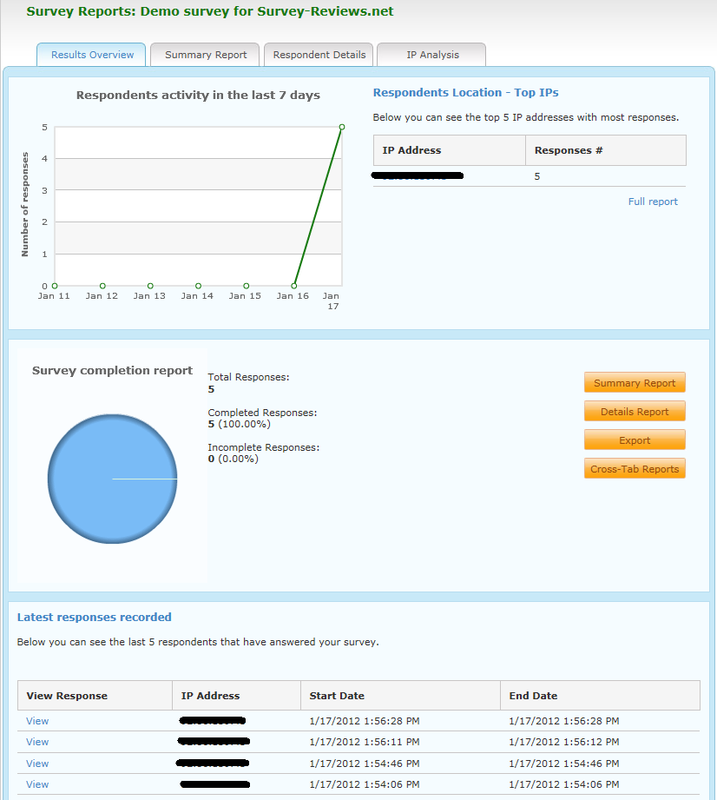 The number of collected responses can be easily tracked on the surveys dashboard. Here you can also remove all the responses received to the survey, delete the entire survey if you like or have access to the survey sections we previously covered (edit survey, survey options, collect responses, reporting). The results overview displays a chart with the number of responses received in the last week, top IP addresses with most responses, survey completion report, links to the last 5 responses received. Besides the reporting overview page, free account users also have access to the summary report and to the details reports. They both look very nice and are very simple to use. 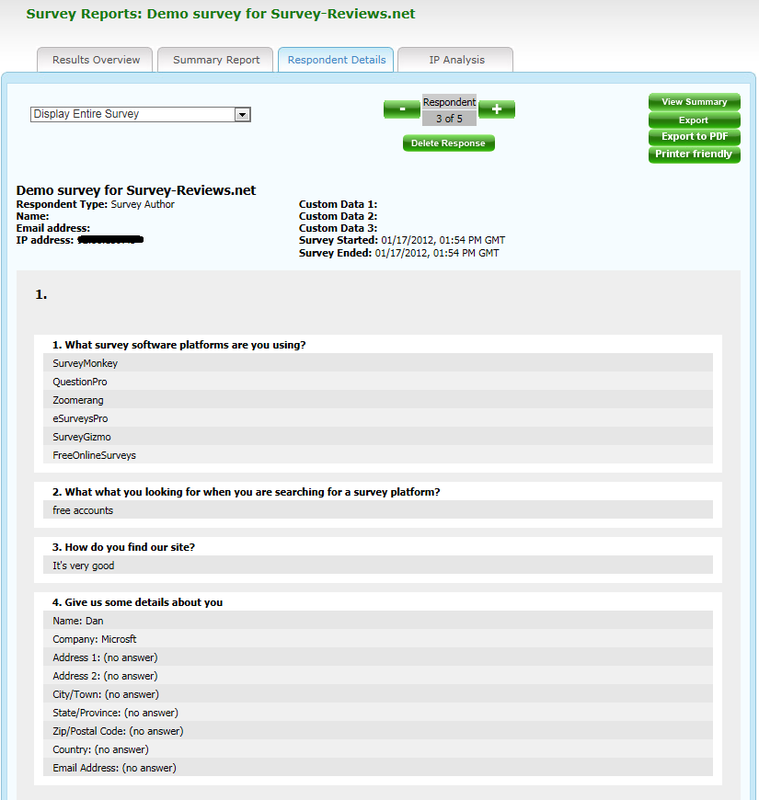 Besides surveys, eSurveysPro.com also has a very advanced polling tool, but we might review that at a later date. Overall, eSurveysPro.com is a site that we liked and found very useful. 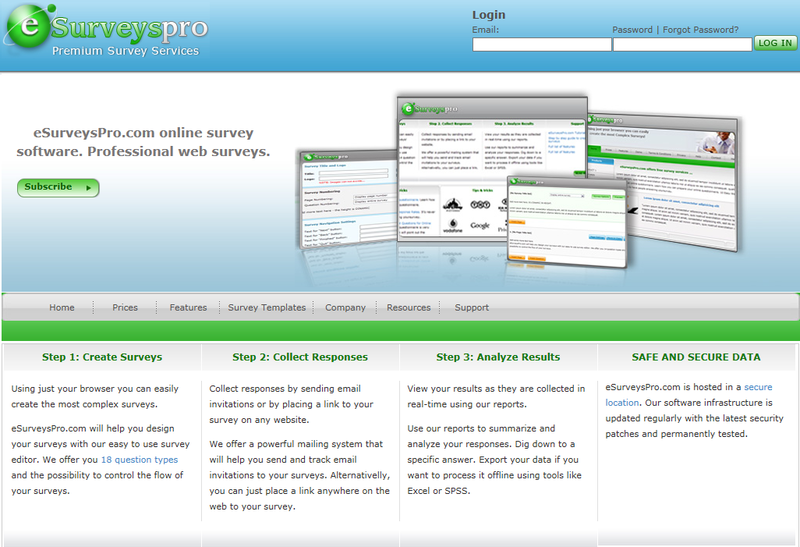 For more details about online survey software tools and survey reviews visit www.analyticstool.com.